CALGARY'S NEW CENTRAL LIBRARY DESIGN WILL FULFIL ITS VISION "TO INSPIRE ALL"
(CALGARY, AB) – In 2013, when Calgary Municipal Land Corporation (CMLC) enthusiastically embraced the role of lead developer of the New Central Library, we were tasked with overseeing every aspect of design and construction of the new library in East Village. The prime design consultant team, Snøhetta + DIALOG, deeply understand that a library is far more than just a building with books – something that’s evident in every aspect of the final design. The final design also reflects important insights and ideas that the project team – City of Calgary, Calgary Public Library (CPL) and CMLC – gleaned from two years of extensive public engagement, which culminated on September 4, 2014, in a public Open House discussion. More than 1,000 Calgarians turned to out to hear how the design team had incorporated their feedback into the functional program. A standing ovation was the net result. Another key criterion for Calgarians was a library with plenty of natural light, and the New Central Library’s grand atrium ushers natural light deep into the building and enhances the exploratory experience within. Another important dimension of the New Central Library, geared toward making its spaces as inviting and inspiring as possible, is the public art program being shepherded by CMLC. 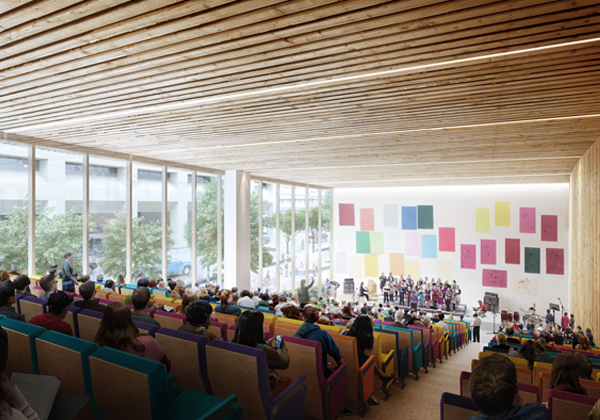 Along with a sophisticated design and engaging public art program, the New Central Library is providing a catalyst for the CPL to reassert its relevance and appeal as it prepares for its next century of operations. Construction of the New Central Library is already underway with the LRT encapsulation program. Soon the first installation of hoarding art will envelop the site. We invite Calgarians to follow our progress via a webcam on the Bow Valley College building. Imagined as a mixed-use, amenity-rich master-planned neighbourhood in the downtown core, East Village will be home to more than 11,000 residents upon completion in 2027. With local amenities like RiverWalk, St. Patrick’s Island Park, the New Central Library, National Music Centre and an urban shopping centre, East Village has become a highly desirable neighbourhood in Calgary’s downtown core. For more information about the East Village project or to watch our 3D animation on the New Central Library, visit us at www.calgarymlc.ca/ncl.